Landscapes by Land Art Landscape Architecture offers a full range of outdoor living imporovements. Our Orlando Irrigation services provide support services to our Orlando Landscaping installations. Additionally, we offer a full range of hardscape improvements including pavers, natural pavement services, Walls, Fences, Trellises, Summer Kitchens, Gazebos and more. Orlando Irrigation repair services are available on an as needed basis to service your emergency irrigation repairs. Our Orlando Irrigation Team is ready to handle all of your irrigation needs. 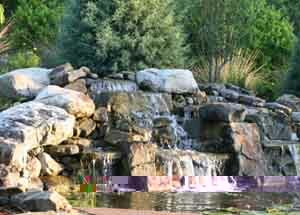 Water features are one of our specialties, using natural boulders we can transform a barren sodded area into a lush water garden, that truely appears natural, invites wildlife to cool off with a drink of water, and birds will splash in your irrigation spray, truely "going green". In addition to hundreds of highly satisfied homeowners, our Central Florida / Orlando irrigation and landscape teams are proud to be associated with these fine establishments; Wyndham Palms Resort & Country club, Valencia Community College, South Lake Hospital (landscape and Irrigation), Vista Park Resorts, Pinnacle Financial Corporation, Orlando Irrigation services for Terra Firma Commercial Development, Interlachen Country Club, Mystic Dunes Golf & Country Club, Hunters Creek Community, South Lake Forest Community (Orlando Irrigation and Landscape Services), Formosa Gardens Estates, Elite Resorts. A photo of a recent Orlando Irrigation project. Landscapes by Land Art Landscape Architecture constructed this project from start to finish including irrigation in Orlando Florida. Click this image to see before and after images.